Friday December 9 1910 It was twelve years today since Edith died Will was busy about the place all day. I went to town at 2.15. Was up in Otts office to finished [illegible] for "The Abstract." He owed me about $73.00 and I still had to pay him $5.00. We are glad to get the business settled. I did some errands and came home in a snow storm at 4.30. Did evening work. 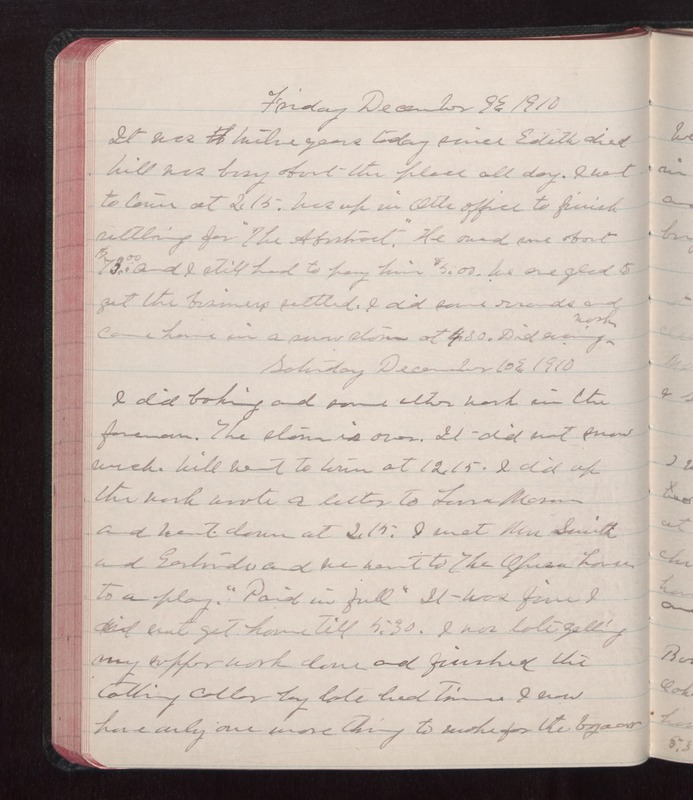 Saturday December 10 1910 I did baking and some other work in the forenoon. The storm is over. It did not snow much. Will went to town at 12.15. I did up the work wrote a letter to Lorna Mason and went down at 2.15. I met Mrs Smith and [Earlindo?] and we went to The Opera house to a play, "Paid in full" It was fine I did not get home till 5.30. I was late getting my supper work done and finished the tatting collar by late bed time. I now have only one more thing to make for the bazaar.